Holacracy asks a big question: How can organizations be designed in a way that really works, for everyone in the organization? Right now, orgs are often structured according to power from the top to the bottom, rather than self management distributed throughout the organization. This slows orgs down and demotivates some people. 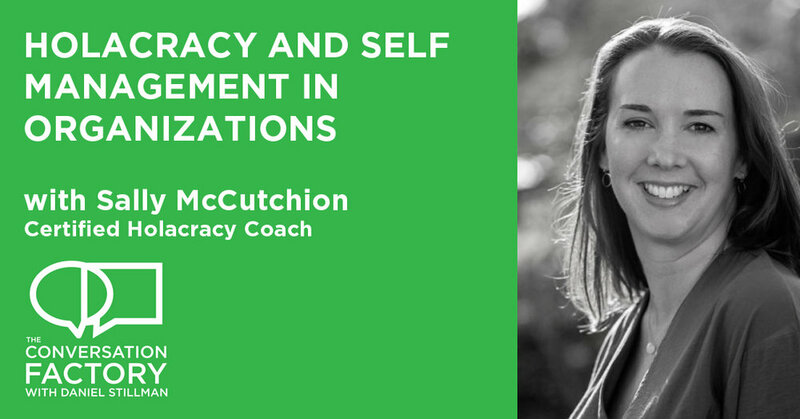 In this episode, I talk to Sally McCutchion, a certified Holacracy coach based in the UK. Sally teaches public workshops on Holocracy and coaches orgs in making the shift to working with Holacracy. Sally and I had a seriously wide ranging conversation about Holacracy. We hit on some big topics towards the end that I've placed in the extras, which you can find here. Check those out, as they're really juicy, just scroll all the way down! One conversation design principle of Holacracy is to allow information and knowledge to flow through the org. Too often, people at the "edges" of an org, the people closest to the users, know a lot about what's wrong and how to make it right...but those same people don't feel empowered or safe to speak up, or even to just do something to shift issues. One CEO who's organization I coached years back desperately wanted people to feel a sense of ownership: How, if you own your house, and the toilet is running, you fix it, if you know how, or talk to someone who can. You don't just let it run. Holacracy attempts to open regular channels of communication between areas of the organization and to allow sections of the organization to feel that they can solve problems that they see without asking permission, waiting for permission, identifying if permission is even possible. Holacracy designs several meetings within orgs very rigidly, in order to break down power structures and allow all voices to be heard: People are expected to bring updates framed as needs, not just complaints. Other structures are a lot more open and can be adapted to the unique company requirements. It is without a doubt a very interesting design for organizational conversations. I get into the weeds with Sally a bit, and if you follow the links in the show notes you might find some of the terminology and structures dizzying...but the forest and the trees of Holacracy are worth absorbing: That self managementand purpose are essential all scales: at the scale of the person, the team, and all throughout an organization.